BRA approved project 1 hour ago. Fenway to get more housing and a little higher. McDonald's lot foregoing office space for all residential. They rendered the interior of the "neighborhood community center" but nothing else of the project? Sigh. The Abbey Group is remixing its $150 million mixed-use project in the Fenway neighborhood, forgoing office space and going all residential. 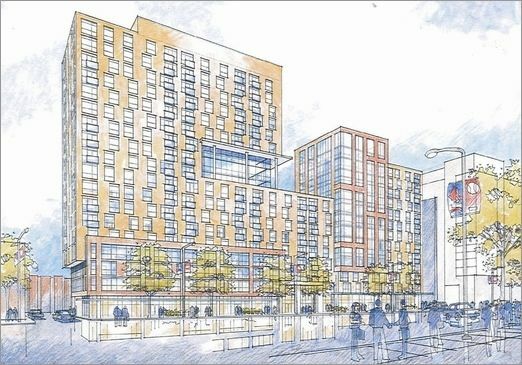 The Hub developer now plans 322 units of apartments and condominiums — up from 210 apartments only — for 1282 Boylston St., according to revisions recently filed with the Boston Redevelopment Authority. “After studying the market over the last year, we determined there was greater demand for additional housing in the area, as well as a need for home-ownership opportunities,” said Audrey Epstein Reny, the Abbey Group’s director of marketing. About 100,000 square feet of office space was removed from the project, which the BRA approved in November. The building will be slightly larger with the overall square footage increasing by 7,000 square feet to a total of 344,000 square feet. A portion of the west tower section of the building has increased to 190 feet high, from 180 feet — meaning the top height may be 17 stories instead of the original 16 floors. “The changes ... do not increase any impacts on the neighborhood,” the developer told the BRA in its filing about a month ago. The project replaces a McDonald’s restaurant at the corner of Boylston and Jersey streets. The fast-food joint was demolished last year and turned into a surface parking lot, taking advantage of game days a block away at Fenway Park [map]. With the residential component increasing, the project will create another 15 units of affordable housing, on top of the previously approved 21. The recent filing also revealed a $1.4 million contribution to “community benefits” from the project. The Abbey Group expects to break ground sometime next year and open 1282 Boylston in 2015. Agree. ANother cookie cutter condo. Great. I went to the meetings for this and if I remember correctly, I think they are using the same material that was used for the MassArt dorm tower. So material-wise, it may be something different than what the Fenway is use to. Don't like the render at all, but maybe I just need to see a few more angles and get a better sense of how it integrates with what else is already there. Whoever said "International Village plus tumor" gets a cookie. Actually, now I think it looks more like a demonic spawn of International Village and the new MassArt dormitory. Well hello there! I'm having fun imagining a proper 10+ story streetwall through this stretch. They were doing what looks like soil testing today on the site.